Even a Burlingtonian accustomed to driving past student rentals will be struck by the glut of prayer flags in Himalaya Restaurant. The primary-colored cloths hang like peacefully sleeping bats all over the restaurant’s ceiling. The transporting effect continues with the saffron walls. They’ve been painted with scenes from Buddhist parables by a monk, Dhondup Tsering, who also happens to be the chef. It’s hard to believe this serene scene is in Plattsburgh, a town better known for its former military base than for its ethnic foods. 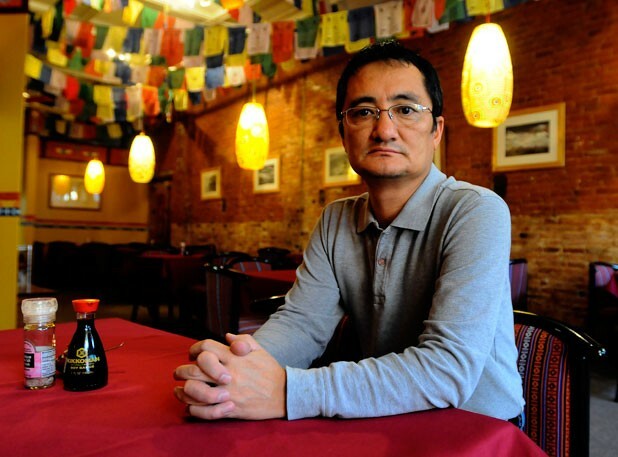 Nonetheless, Himalaya Restaurant’s owner, Tenzin Dorjee, says the town has embraced his family and his business, which opened in March. And one day Vermonters may have a chance to embrace it, too. Dorjee moved from New Jersey to Plattsburgh three years ago with his wife, Yangchen, their two children and their old friend Tsering. The restaurateur says the five of them now account for Plattsburgh’s entire Himalayan population, save one Tibetan woman who studies at SUNY Plattsburgh. The family came to the United States when their now-13-year-old daughter was 1½. 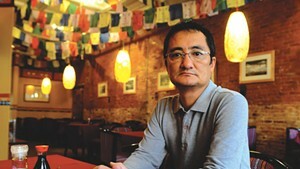 Dorjee says his wife’s work in the Tibetan independence movement had long made them targets for Chinese agents. “We just learned to live with it,” he says, even after he was hospitalized following an assault. Case in point: At lunch last week, Dorjee spent much of his time chatting with an older couple who were curious about the cultural context of the food he serves. There’s a lot to learn. Himalaya Restaurant offers a focused menu of specialties from Tibet, Bhutan and Nepal. The three cuisines are far more different than one might imagine. And the half-Tibetan, half-Bhutanese Dorjee, whose first language is Nepalese because of a native nanny, is in a good position to appreciate them. Tibetan food, he explains, is fresh, mild and mostly steamed. Nepalese curries use the same fresh spices as Indian cuisine, but in much smaller doses. Bhutan specializes in food made fiery with chili peppers to keep bodies warm at high altitudes. Unless guests order their food spicy in advance, Tsering prepares it at more Western-friendly levels. That’s how Dorjee prefers it, too. The son of a high-ranking official in the Bhutanese government, the restaurateur attended a British-run boarding school in India from the age of 3. There, he was weaned on bland egg and bread dishes, and he admits that he still has a subnormal tolerance for spice. Slim and well groomed, Dorjee has a professorial vibe and a grasp of the English language superior to that of many Americans, with just a hint of an Indo-British accent. Drawing on those youthful experiences, Dorjee carefully trained Tsering in his turn. The Gelug monk is not only a chef and painter, but also an expert butter sculptor, a skill he showcases each winter at the Festival of Tibetan Arts that the Dorjees organize in Plattsburgh. Americans may have heard of a similar practice at midwestern dairy festivals, but shaping and dying yak butter into the forms of religious icons called tormas is an old Tibetan Buddhist celebratory tradition. Tsering does most of the cooking at the restaurant, while Dorjee converses with guests, and Yangchen runs their adjacent store, TibetAsian gift shop. Although Tsering doesn’t follow the vegetarian diet to which many Buddhists adhere (even the Dalai Lama only goes veggie every other week), he still can’t eat some of the foods he prepares. Pork and beef are acceptable because one animal can feed multitudes. Since smaller animals, such as chicken and fish, must die to fill a communal bowl, they are taboo choices. Locavores can’t argue with the meat at Himalaya Restaurant. The beef in the Tibetan stir-fries and noodle soups comes from grass-fed cattle at Parker Family Maple Farm in West Chazy. Adirondack Heritage Hogs supplies the pork ribs and belly in Bhutanese stews and the loin in Nepalese pork tarkari. It was Dorjee’s father who instilled in him the value of serving only quality ingredients. “One of the things we were always taught by my father — if you can’t eat it yourself, you have no right to feed it to anyone else,” Dorjee says. He means it — the day Himalaya Restaurant opened, it lost $600 because Dorjee refused to sell the hormone-packed meats delivered by a wholesale company. A beef-stock soup called thenthuk tastes of meaty marrow thanks to the beef bones Tsering refuses to waste. Its name comes from the Tibetan words for “pull” and “noodle.” The jagged pasta shreds in the soup resemble large Alpine spätzle. Through the summer, the Dorjees grew many of the orange broth’s ingredients in their own garden. Now, in the off season, they populate it with store-bought organic tomatoes, chard and onions. Furthermore, says Dorjee, most Western restaurants get the momo texture wrong in an effort to coddle diners with something closer to the Chinese dumplings they’re used to. The beef and chicken in the dumplings should be coarsely chopped, not ground. Slightly crunchy chopped onions, carrots, cabbage, spinach, potatoes and peas spill out of the vegetarian version. It’s like a steamed vegetable salad in a chewy, wrinkly wheat skin. The deep-red sauce served on the side is characteristically mild to suit Dorjee’s taste, but still has a peppery burn that builds as the meal progresses. A good way to calm it is with a cup of foamy butter tea. A warming drink popular in Tibet, the hot liquid is indeed salty butter mixed with tea. Yak butter is traditional, but hard to come by in Plattsburgh, so Dorjee substitutes conventional cow butter. He says he wishes he could afford to use meat from Vermont Yak Company in Waitsfield, but finds the price prohibitively high for his menu, which tops out at $13.75 for Nepalese curries with pork and salmon. Also among the most expensive dishes, at $12.75, is a Bhutanese dish called tsipsha paa. In a big city, the braised pork ribs would retail for far more. The meaty baby backs are lusciously soft, but adhere well enough to the bone to be eaten with one’s fingers. Their tomato-based sauce is flavored with the fresh ginger, garlic and chili powder that Tsering keeps neatly organized in Mason jars beside the stove. The accompanying whole chard leaves stew with the pork and soak up its spices and flavor. Dorjee gives diners a choice of white or brown rice, but says a hard-to-find red variety is standard in his homeland. Dorjee is currently working on getting a license to serve beer and wine. He points out that Himalayans love their booze, especially Bhutanese: “In eastern Bhutan, they make liquor out of everything. In Bhutan, any crop you teach them to grow, they’ll grow it and make liquor out of it,” he says. “It’s kind of like college kids.” Eventually, Dorjee hopes to procure a license to distill his own Himalayan hooch. That may be more likely to happen in Vermont than Plattsburgh. The restaurateur has his eye on adding a Burlington location. “My wife and I are pretty passionate about doing a restaurant in Burlington. We are keeping our eyes and ears open,” says Dorjee of looking for an affordable space. He’s been taking on extra computer jobs to finance the Vermont spot with no help from the bank, just as he did with his current restaurant. The family hopes to open in the Green Mountains next summer and to use Vermont farms as suppliers. Dorjee says he’ll hire extra help at both locations so he can travel between the two each day. He adds that he’s grateful to Plattsburgh for embracing his family, but he looks forward to being able to serve some of his favorites that New York diners have rejected, such as Bhutanese pork belly with potatoes. Sooner rather than later, it looks like Burlington will be tasting the Himalayas.